Sub Zero Refrigerators are the ultimate in-home refrigeration products with both superb quality and incomparable style. The price varies from one model to the next, but often they’re hailed as the luxury car of the kitchen. The fridge and freezer units are designed to keep food fresher with an elite air purification system and microprocessor that automatically makes the necessary temperature adjustments. In the event that multiple prices were available, the highest was taken. These are the manufacturer suggested retail prices only. What you find at the vendor may be different from what is posted on this website. Are Sub Zero Refrigerators worth the price? We get this question a lot from our users. It’s no secret that the price can create that sticker shock and immediately scare a lot of potential buyers off. The best way to answer this question is by comparing them to a different brand. This is the slogan that we like to use and how we describe the product to interested buyers. “Sub Zero is like the Apple MacBook of Refrigerators”With laptops, there are tons of other substitute options available from many different companies. Almost every single competitor’s laptop is priced to be much cheaper than the Apple Macbook. So why do people buy so many Macbooks? It’s not all about price. Macbook users know that the quality, craftsmanship and design of the product makes it well worth the money and that it’s not worth compromising for anything less. The Mac operating system works perfectly with your iPhone and other pieces of technology in your life. Did you know that you can sync your wine cooler to your home alarm system? The price is set to ensure the high quality and refusal to compromise set by Sub-Zero and Wolf. They aren’t for everyone but if you want the best, it’s available to you. Whether your food is fresh or frozen, dramatically changes the preservation needs in order for it to maintain its quality over time. You can’t have the same temperature, moisture and climate in the regular compartments where fruits and vegetables go as you would in the freezer. Frozen foods need that dry, moisture free, setting to prevent any sort of freezer burn. In a standard unit, there’s only one compressor for the freezer and refrigeration unit. This can cause quality issues as the single compressor struggles to maintain the optimal settings. In Sub-Zero units, there is a separate compressor and evaporator for each compartment. This prevents the unit from using so much electricity and can keep food fresher for about 20% longer than average refrigerators. Did you know: The average American home is wasting over $600 of food a year because of spoilage. Is it time that you looked at a better option? Beyond having a separate compressor and evaporator, there is a microprocessor that can automatically adjust to your own personal settings varying by one degree at a time. Everything from the internal lighting and temperature settings, to the fans, can be changed. The fully customizable options make this a very popular item in many different households. Defrosting feature: The microprocessor is set to your local patterns of climate, time and season. If you’re going through a hot summer it will know that less defrosting is required or that cooling is vital when the doors are opened and closed. If maintenance is ever required, Sub-zero will automatically notify you of the request. Air purification feature: Ethylene gas is purified through the build in air filters that were inspired by a similar NASA project. Every 20 minutes these gases are removed from the refrigerator and it can have a dramatic impact on reducing the wilting and spoilage of vegetables while keeping them fresh and crisper for longer periods of time. The purification almost completely keeps out the mold, bacteria and viruses. Energy Star certified: The independent certification means this product saves electricity, money and the environment It’s a great designation to have and you’re not sacrificing any functions or features. Most units use only up to 404kWh annually or around 11 cents an hour. That means it’s using less power than a 100-watt light bulb. While the number will vary depending on which one you purchase, it’s estimated that your fridge will cost less than $50 a year to run. PRO48 Refrigeration: These are the best products in the Sub Zero line. PRO48 refrigeration units are stand-alone and composed of 100% steel. With dual refrigerators and three evaporators, they are consistently a top-rated offering in both features and appeal. PRO48 models come with or without a glass door and the average price is around $16,000. Built-In Refrigeration: These units fit into your existing kitchen cabinetry and layout. They are not meant to stand alone and do not have the same amount of space as the PRO48. However, if your kitchen was designed for a built-in Sub Zero Model then you’re going to very pleased with the end result. Integrated Refrigeration: Integrated units are similar to the built-in models, except they are not the same size as the traditional refrigerator or freezer. These will be built into your cabinets and can have a lot of different uses like keeping vegetables by the sink or meats by the stove. Wine Storage: As a wine drinker, you are aware that the elements can have a damaging effect on the quality and lifespan of the wine. 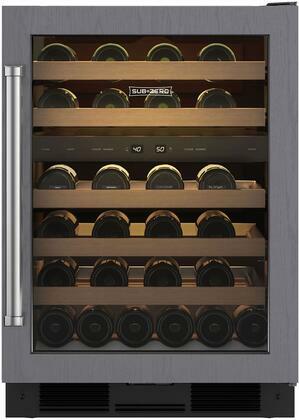 Wolf creates the ultimate wine cooler offerings that fit any home and can hold up to 147-bottles in one single unit. 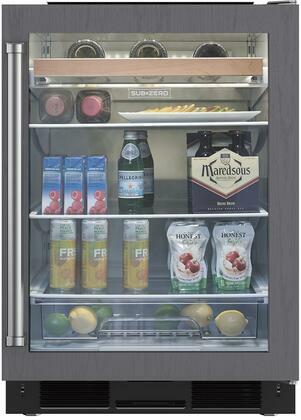 Undercounter Refrigeration: Wherever storage is needed, Wolf and Sub Zero are there for you. These units can be installed throughout the kitchen, but also in the living room, game room, home office or bar area. Undercounter refrigeration offers the same quality in the house, but also outside. Another popular product created by Wolf is the wine cooler storage systems that have three independently controlled temperature storage zones. These prevent any swings in temperature of your wine and can create the ideal balance of flavors. They are very similar to the professional options available out at wine bars and other venues. While some may say “room temperature” is ideal for red wine, this doesn’t account for the different swings in temperature the wine experiences before it’s served. Perhaps if the wine is exposed to sunlight during extended hours of the day, this may throw off the equilibrium and create an unacceptable imbalance which disrupts the sweet, sour and bitter flavors. The models available can be used in the kitchen, but also bar areas, outdoors or in the entertainment rooms. With so many different custom options available, these units can be built into existing cabinetry and other areas. View all models and prices here. Westye F. Bakker, the founder of the Sub Zero Brand was the first person in the world to ever build a freestanding freezer back in 1943. He founded the company and began manufacturing premium in-home units for consumers just two years later. Throughout the companies history, they have continually shown their ability to innovate within the industry and release high-quality products that exceed expectations. Even amongst new competition from other brands, Sub Zero Refrigerators have been able to stand alone as an elite manufacturer. Sub-Zero was acquired by Wolf in March of 2000. The union between these two premium brands created a new force within the market. Wolf primarily makes heating oriented products like stoves and ovens, while Sub Zero makes cooling units like refrigerators and freezers. It only makes sense that two respected brands would join to continue to lead the industry in products.